Two hours north of Madison, tucked away in small Rome, Wisconsin, is the home to America’s next great golf resort, Sand Valley. Up until now, Rome’s fame has been the paper mills that employ much of the area and supply paper to the world. Sand Valley is the latest project by Mike Keiser, who has the goal of bringing the seaside links golf we see at the Open Championship to the heart of the midwest. I was able to make a trip up to Sand Valley with three buddies for preview play a few weeks ago, and we were all blown away at what’s being built. As of now, two courses are under construction with many more on the way. The first course has 13 holes open and is being built by the legendary duo of Bill Coore and Ben Crenshaw. They have teamed up to design other great courses including Sand Hills, Friar’s Head, Bandon Preserve & Trails and Old Sandwich Golf Club just to name a few. The second, which is still at an infancy stage, is targeting 2017 for preview play and is being built by David McLay Kidd. He designed the first course at Mike Keiser’s Bandon Dunes Resort as well as The Castle Course at St. Andrews, TPC Stonebrae and Tetherow Golf Club among others. One of the core pieces to building a great golf course is a great property to build on. The majority of the world’s best golf courses are built on sandy soil and Sand Valley is no different. Keiser was able to take over 1700 acres of rolling sand dunes which were previously occupied by a pulp tree plantation that harvested red pines. The site is situated in a glacial lake bed, which creates the dramatic vistas and 60’ elevation changes around the golf course. It is evident upon entering the gates that Sand Valley’s land is ideal to build a golf course. Minimalism is a theme from the start at Sand Valley. It was my first experience playing a golf course that was still under construction, with the bunkers not all filled in, the walking paths not clear, but it gives you a look at the architectural foundation of the golf course. Coore and Crenshaw start out with a bang and a birdie opportunity with this short par 4. The 1st hole gives players a glimpse of what’s to come, by forcing them to make a decision on how aggressive they wish to play. The opener doglegs left around a giant bunker that runs the length of the hole. It begs a long hitter to go for the well protected volcano green complex. A tee shot to the right in the fairway leaves a player with an awkward uphill wedge shot to an elevated green complex that features multiple tiers and many tucked pin positions. All four of us went for it and saw a mixed bag of results with an eagle 2, a birdie 3, a par 4 and a bogey 5. The first tee shot at Sand Valley. A look at the elevated first green at Sand Valley. The view back from the 1st green. The 2nd hole at Sand Valley is probably my favorite, a challenging par 4 doglegs right and requires a well-placed tee shot to have a look at this semi-blind approach. Coore and Crenshaw allow players to shorten the hole with a tee shot down the right side which brings the bunker into play and will leave a wedge into the green. The only problem, a tee shot down the right side will leave a difficult blind approach with few landmarks to aim for. Therefore, an ideal drive is down the left side to the higher part of the fairway, leaving a mid-iron approach to a difficult green. The green complex is a dandy, running front to back with severe dropoffs on the right and back side making this green appear to float above the rest of the course. The 2nd tee shot at Sand Valley. The approach shot to the 2nd green. The 2nd green with the severe dropoffs on the right, back and left sides. After the challenging 2nd, we moved on to the one-shot 3rd, a redan hole. The third features a giant front shoulder that will funnel balls hit on the left side of it towards the middle of the green, while a shot on the right side will find a terrible place to chip from (I did this...twice). The green is guarded by a large bunker that covers the front and left sides of this big green. What I love about this hole is it gives the lessor player a shot at running it up close by using the redan slope, while also challenging a great player with a tough mid to long-iron approach. The par 3 3rd at Sand Valley. Don't miss your shot right or this is what you are left with at the 3rd at Sand Valley. A look from behind the 3rd green at Sand Valley. If your adrenaline isn’t pumping at this point, the par 5 4th will give a jolt to anyone. This beautiful long par 5 plays uphill, and its wide fairway is protected by waste bunkering on either side. A long tee shot will catch a downslope and give a player an extra 40-50 yards making it reachable. A player’s approach to the green can be played high and soft or low and hard as no bunkers protect the front edge of the 4th, just a large false front. The 4th hole at Sand Valley. The approach to the long par 5 4th hole at Sand Valley. Looking back at the 4th hole at Sand Valley. 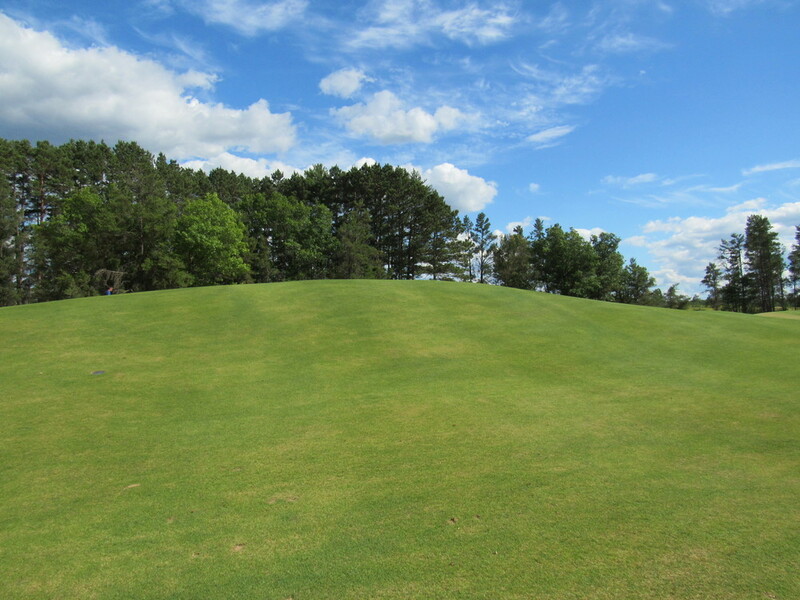 The high-point on the golf course, the 5th yields dramatic vistas of the beautiful Sand Valley property. This par 3 plays significantly shorter due to the downhill slope and is extremely tough when the wind blows. Any shot a little offline will find itself in the depressed chipping areas that surround the green, making for a tough up and down, while a good shot gives a player an excellent chance at birdie. A panoramic of the view from the 5th tee box. The short iron shot into the 5th green at Sand Valley. The tough par 4 6th starts with a semi-blind tee shot that forces a player to navigate a large fairway bunker that cuts in the left side of the driving area. You can choose to lay up with a 240 yard shot off the tee to stay short of the bunker, leaving a mid to long-iron approach. Choose the alternative and you challenge the bunker with a tee shot to a narrow 25 yard landing area setting up a short-iron approach shot. The approach to the large 6th green requires precision. The green’s front half is filled with subtle breaks before it drops into a punchbowl back half. A shot that fails to get into the punchbowl leaves awkward chips and challenging downhill putts. A look from the front of the 6th tee box at Sand Valley. The approach to the 6th green at Sand Valley. Be sure to hit your approach the right distance on the 6th, or you will have a tough putt. After the par 4 6th, you move on to the second par 5 on the front 9, the long 7th. We played this hole from the regular tee the first go around which made it reachable in two. The second time around we played the back tee which changes the birdie hole into a tough par. The tee shot is dictated by the large sand dune that runs along the right side. From the regular tee, a long hitter can carry everything and leave themselves with a clear long iron approach shot. From the back tee, everyone must play to the left side, which obstructs your view of the green. A layup shot to the 7th is influenced by great cross-bunkering, making a player choose to carry in order to get to wedge distance or lay back and play a mid-iron shot into the small and well-protected green. The tee shot from the back tee on the 7th hole at Sand Valley. The approach shot to the 7th green at Sand Valley. A close look at the 7th green at Sand Valley. The third one-shotter on the front nine is sure to test any players nerves. The 8th requires a precise wedge shot to the uphill green. Our group’s average handicap was +3, and in the eight shots we hit to the green only four found the putting surface. The green is long and narrow with a back shelf. We played the front pin, which is an extremely tough shot because of the large deep bunker that guards the right side. A shot to the left will kick off the bank and funnel towards the hole. The 8th is as good of a short par 3 as I have ever played. The challenging short par 3 8th at Sand Valley. A look at the front of the 8th green at Sand Valley. Looking back from the 8th green at Sand Valley. After the nasty short 8th, Coore and Crenshaw give players another shot at birdie with the risk/reward 9th. Measuring only 306 yards, long hitters are able to drive the green, but woods guard both sides and narrow as you get closer to the green. A smart play is to lay back, leaving yourself with a full wedge into a heavily sloped green. The 9th green features a large shelf that divides the front and back half. When the pin is up front as we played it, the shelf gives a backboard to play shots off of, but as I experienced, overshooting the backboard is not recommended. The second shot to the 9th at Sand Valley. The front pin on the 9th at Sand Valley allow players to use the heavy slope as a backboard. On to the back side and the downhill par 5 10th. A good drive must avoid the large bunker that sits in the middle of the wide fairway. From the fairway, a player is left with a downhill shot to the green protected by a massive bunker on the right side. A good shot will funnel the ball down to the middle of the green and close to the pin with this punchbowl like green complex. The 10th tee shot at Sand Valley requires players to avoid the giant bunker in the middle of the fairway. The approach to the 10th green at Sand Valley, don't go right! The view from the back of the 10th green at Sand Valley. An uphill dogleg left tests a player’s game by requiring two good golf shots for a birdie chance. A good drive is hit over the bunker that sits in the middle of the fairway, leaving an uphill shot to a small sloping green. The par 4 dogleg left 16th at Sand Valley. The approach to the 16th at Sand Valley requires a precise mid-iron shot. A jaw-dropping par 3, the 17th is a massive punchbowl. Measuring just under 250 yards from the tee, the 17th calls for a 3-wood or long iron for a long-hitter to get the ball to the green. Accuracy isn’t quite as important as other par 3s, as the punchbowl slopes will kick shots a little left or right back to the middle of the green. The Punchbowl par 3 17th at Sand Valley. The view from the right side of the 17th green at Sand Valley. From behind the punchbowl 17th at Sand Valley. A sad moment as you realize your visit it coming to an end, the 18th is a beautiful uphill par 5. The wide fairway is guarded by various pot bunkers, avoid them and you will be left a chance at getting home in two. The green and second shot are guarded by the massive bunker that runs up the right side from about 180 yards out. A good lay up is out to the left leaving a great angle into the large 18th green. Large might be an understatement when describing the 18th green, which is narrow in the front part with a large false front and nasty pot bunkers long that penalize any shot not hit the right distance. Before it stretches to its back half, which is wide, it goes all the way back behind a mound, giving the grounds crew the option for a blind approach shot. A look at the deep bunker guarding the 18th green at Sand Valley. The sun sets on an epic day at Sand Valley. After finishing up our great round at Sand Valley, our group reflected on how great of an experience it was. We didn’t stand over one shot without being mentally stimulated. The Coore and Crenshaw team did a terrific job giving players shot options at every turn of the golf course which allow players of all skill levels the ability to enjoy their round at Sand Valley. There was great variety in the design of holes and didn’t beat golfers up too much. What I enjoyed was that I left every hole thinking I could have made birdie, but also seeing how a bogey or worse could be made if I hit my ball in the wrong place. While we only played 13 holes, I expect this course to debut within America’s top 100 and most likely find itself in the top 50. Note: The Coore and Crenshaw course at Sand Valley is set to open all 18 holes by September 1st, while the David McLay Kidd course is set to start preview play in 2017. Have another course we should check out? Let us know here.